Ty Magner wins his first stage at the Larry H. Miller Tour of Utah Monday in a bunch sprint in Logan to open the seven-day race. Ty Magner won his first stage at the Larry H. Miller Tour of Utah Monday in a bunch sprint in Logan to open the seven-day race. The Holowesko-Citadel rider beat Brit Chris Lawless (Axeon Hagens Berman) in a photo finish. Travis McCabe (UnitedHealthcare) finished third in stage 1. Magner’s Holowesko teammate Andrei Krasilnikau made the day’s early breakaway. The Belorussian was one of the last men caught before the finish circuits at the end of the 211.2km day. 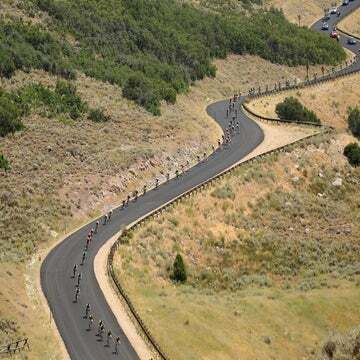 Although the stage’s two climbs of Logan Canyon pared down the peloton, most of top sprinters were in the mix with one kilometer to go. BMC’s Silvan Dillier shot up the left side, just before the final left-hand corner. He lead-out the long, straight sprint, with Holowesko-Citadel positioned behind. Magner opened up his sprint a bit early. In the final 50 meters, Lawless pulled even, and McCabe closed fast. However, Magner kept fighting and with a well-timed bike throw, he took his biggest win of the season. In fact, it was his first win in a UCI race since Tour of China 2012. The 26-year-old will wear the leader’s jersey into stage 2, which will feature a summit finish at Snowbasin Resort after 151km. Kristen Legan contributed to this report.